The film begins poignantly focused in on Rufus Scrimgeour’s (Bill Nighy) eyes as he declares with voice aquiver that “Dark times are ahead.” It is an apt tone-setter for the remainder of this film that David Yates, who has been at the helm since The Order of the Phoenix, steers into previously uncharted territory. The film absolutely has to be applauded for resisting facility and showing remarkable restraint and patience with its storyline. When it was announced that the film would be told in two parts, of course, it smelled like a money-grabbing marketing ploy, which has apparently worked, however, once the decision was made it had to be made to work aesthetically and it has. 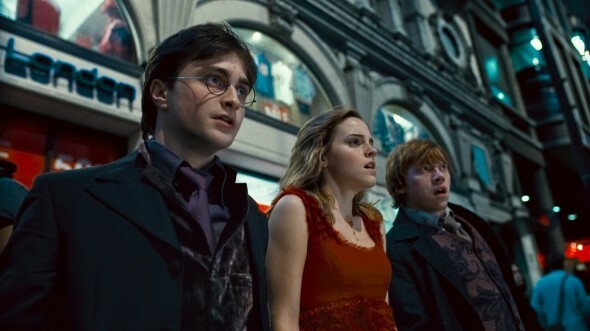 The young wizarding triad finds itself out of school with no mentor left to find horcruxes, fractions of Voldemort’s soul stored in object that they must destroy, which could be anywhere. Where does one start and how does one remain safe amidst constant threat? This film deals with that. They meander about and in fact hide out much of the time trying to gain knowledge from afar. It’s, to deviate momentarily, one of the lasting images I have of the book, their hiding in the forests and the countryside and this film does deal with that to a great extent. Yet the information flow is deceptively consistent, it could seem not much is happening but there is a rather even pace being employed throughout, in which, they are slowly acquiring the knowledge they need to better face Voldemort. With the characters out of the shelter of their ivory tower, one that was hardly impenetrable but where their whereabouts were almost always known, there will not be a tale going from one high-impact incident to another. Yet this film contains more genuine scares than your average horror film because of the suddenness and ferocity with which attacks to occur. Very quickly they find no place is safe. Yet it does set the table extremely well, which there is room for in a series. For the next installment is surely to be full of fireworks. It’s a tremendously human tale in which we see these characters, whom we’ve watched grow up, changed and stressed and furthermore we see actors, whom we’ve watched grow up and improve, flex their muscles and deliver their most solid, rounded and complete performances to date. The rest of the cast as per usual is due their kudos. Firstly, there is Ralph Fiennes who makes tremendous use of the very small allotment of screen time he has. Rhys Ifans is wondrous as Xenophilius Lovegood, first as the tree from which Luna fell not far from and then as a frantic desperate man. Helena Bonham Carter continues to take Bellatrix Lestrange to heights which I thought weren’t possible. Then, of course, there’s Alan Rickman who continues to be deceptively simple in his brilliantly deft performance of the complicated Severus Snape. Also, Michael Byrne as Gellert Grindewald, the elder version, ought not be overlooked for his deliciously creepy short stint. It is quite possible that in a film with seemingly fewer effects shots than most throughout the series that the CG here is the best it’s ever been. Nowhere is this more apparent than with the work done on Dobby who in this edition is one of the most stunningly realistic CG-creations ever. There is of course the matter of the ending of the film to discuss. Much of the Harry Potter film’s success has, I feel, hinged on the endings. Some of them have been a bit too languid on the last shot. Thankfully none have gone Return of the King. The ending of this film is sheer perfection. If you are going to have a bifurcated tale the first half clearly needs to be apparent defeat for our heroes and a moment of triumph for the villain. You could not imagine a more gloriously chilling conclusion than what does transpire in this installment. As a kind of aside the film introduces the concept of the Deathly Hallows early and then enters with an explanation late, with a very ingenious and creative animated sequence. It may be the most prominent use the title object in the series in a while. I loved The Half-Blood Prince but who he was and his connection to Harry did become sort of an afterthought considering all the other events that needed to come to fore. It’s very strange to try and assign a numerical value to any film, as some that don’t receive a “perfect” score stay very near and dear to me, it’s even more difficult for this one. In the end the function of this installment is to inform and make the next one possible. To that end it does the job brilliantly and thus it shall be a 10 for that reason and because I did enjoy every minute. Whether that ranks it amongst the year’s best remains to be seen.